Transform your circle time into a collective story. Ask each child to tell a story about something which happened in their home. Transform your circle time into a collective story. Ask each child to tell a story about something which happened in their home. Encourage children to add their ideas. Jot down everything they say. Read their collective story to them once they have all had a chance to speak. They may illustrate their story and display it on the wall. Hang a clothesline in your daycare, approximately 2 metres above the floor. Hang a sheet or blanket on it to create a tent (table with a sheet or blanket draped over it). Use pins to display children's artwork on the tent. Drape sheets over as many tables and chairs as possible to make several tiny houses. The pictures may be used as a memory game or to spark a conversation with the group. Use them to decorate the daycare or a specific thematic corner. (Open picture game - My home) Print, laminate, and store in a "Ziploc" bag or in your thematic bins. Blocks of all kinds can be used for building their own house or their neighbour's house. Figurines of all kinds, children may use them to reproduce their family. Figurines representing construction workers, they are the ones who build our homes! Construction vehicles of all kinds. Ask parents to provide pictures of family members and stick popsicle sticks to the back. Children can use them as puppets. Collective mural of children's homes: large white paper, people cut out of catalogues, paper and cardboard of all colours to build homes. Recycled material which can be used to build a 3-D house. Ask parents to collaborate. Pre-cut cardboard shapes children can use to create their house. Paint sample cards which can be cut. Old decorating magazines, children can cut out their favourite decors. A square and a triangle cut out of Mac Tac. Fill the shapes with crumpled up pieces of tissue paper to make a stained glass house. Coloring pages representing different types of homes. Stencils of houses or shapes which may be used to make houses. Decorate your area with pictures of people of all ages. Decorate your area to make it look like a different part of the house each day: the kitchen, the bedroom, the living room, the bathroom, etc. Add all necessary accessories. Bedroom: mattress, sheets, small table, books, etc. Living room: Armchair, blanket, television, etc. Bathroom: Empty toilet paper rolls, empty shampoo bottles, toothbrushes, etc. Memory game with illustrations of familiar objects which can be found in a home. Modeling dough with uncommon accessories (forks, spoons, spatula, pizza cutter, etc.). Association games found in educatall's theme. Bricks, pieces of wood, etc. Various construction materials which may be manipulated. 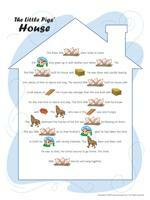 Storybooks about houses, The Three Little Pigs, princesses in castles, etc. Picture books showing different types of houses. 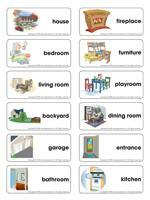 Word flashcards representing objects found in homes. Dotted outline of a house for tracing. Soil bin: Perfect for gardening behind the house. Water table: Time for spring cleaning throughout the daycare! Recognizing familiar sounds in the house (store-bought or homemade game): doorbell, telephone, washing machine, etc. Box containing several objects which may be found in homes (toothbrush, pencil, comb, etc.). Have children touch and identify them. Bake and build a gingerbread house or simply use tea biscuits with icing to hold the pieces together. (Open picture clue story - My home) Print. Sit in a circle with your group. Begin reading the picture clue story. Pause for each picture clue. Point to the clue and have children guess the missing word. Build a house with sheets and boxes. Have several items such as plastic containers and empty cardboard boxes handy for the duration of the theme. Your local grocer will be happy to give you boxes. Let children use their imagination to play with them. They will most likely spend hours building houses and creating rooms. Provide several towels, chairs, and tables children may use to build cabins. Divide the group into two teams. One team leaves the room. During their absence, the other team moves five different objects around. For example, they may place a cushion on the floor, remove a remote control, change something on a team member, or overturn something. When the other team returns, they must find the five differences. Collect 1-litre juice or milk cartons and clean them thoroughly. Have children decorate them with whatever you have on hand. Cut an opening on the side for the garage door. Let children play with small cars and their new garages. Invite children to paint on an old sheet. Hang a rope from one end of the daycare to the other and drape the sheet over it t o make a tent. Variation: Add several sheets to make cabins. Have fun sorting objects by shape, size, colour, type of material, etc. Deposit several boxes in your daycare and tape illustrations to them to allow children to associate objects to the correct category. Gather all the tools you have in your construction area and ask children to fix toys, shelves, walls, etc. Leave plastic food items, dishes, and utensils in your kitchen area. Choose a child to cook the meals requested by the other children. Fill a large container with water. Add sponges and soap. Let children wash all the plastic dishes you have in your kitchen area. Present your group with a laundry basket filled with clean items such as facecloths, socks, etc. Have children fold them. Children love to clean! Provide them with several sponges, feather dusters, wet towels, etc. While they are having fun, disinfect your toys. Purchase small glow-in-the-dark stars and moons and stick them to the underside of a table. Drape a blanket over the table to make a small house and to hide the light. Invite children to find the surprise under the table. Variation: Repeat the activity using stickers or shapes which do not glow in the dark. Give children a flashlight so they may discover the surprise. Squirrels build their homes in tree branches or tree cavities. In winter, they live off of food they carefully collected during summer and fall. A single hideout or cache can contain several hundred pinecones. Go for a walk in the forest with your group. Give each child an empty tissue box they may use as a cache to store their findings, just like a squirrel would do. Use their leaves, pinecones, acorns, branches, etc. for crafts throughout the theme. Drape old sheets over your outdoor furniture, tables, long chairs, etc. Children will love playing in their cabins. Add objects which can be found in the woods. Give children plenty of time to enjoy their cabins. You may even let them eat their snack there. Go for a walk with your group. Show them different types of homes: single family homes, apartment buildings, townhouses, etc. Ask children to show you a house which looks like their own. Have each child bring a storybook from home and exchange with another child. Let children bring it home with them. This will encourage parents to read to their child. (Open hunt and seek - My home) Print and laminate. Children pick cards and must find the objects in the scene. (Open association game - My home) Print and laminate. Using Velcro, children associate the objects to the correct room. (Open magnifying glass game - My home) Print and laminate. Cut out the illustrations and store them in a "Ziploc" bag. Children pick an illustration (large object) and search for it on the board game, using a magnifying glass. Once they have found the matching illustration on the board game, they place it on top. (Open game - House under construction) Print, laminate, and cut out each piece. Children sit on the floor and assemble the pieces to create a house. Set up a tent in your daycare or outdoors. Gather sleeping bags, stuffed animals, and cushions. Set up a variety of games inside. Change everyone's naptime space. Let children choose where they want to rest. Discuss why rearranging items in our home is interesting. 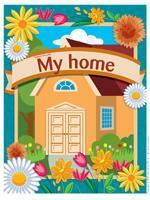 (Open story and memory game - My home) Print, cut out, and laminate the illustrations. Place the cards face down on the floor. Children pick three cards and invent a story in relation to the illustrations. Variation: Print the illustrations twice and use as a memory game. Glue the illustrations to the tops of frozen juice cans to make them stronger. Use small cookies (such as Social Tea) and assemble them with icing to make them look like tiny houses. Cover the houses with icing and decorate with small candy pieces. (Open craft - My door hanger) Print for each child. Have them colour their door hanger. 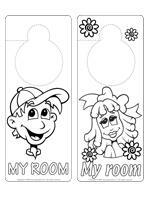 Laminate and let each child bring his door hanger home. Give each child a brown paper lunch bag. Colour, cut out, and glue the shapes for the door and windows. Add a small surprise in the bag. Fold the top of the bag down and add a piece of construction paper, folded, for the roof. You can use jagged scissors to cut the edge of the roof. Cover a milk carton with brown paper. Glue popsicle sticks to make a wooden roof. Help children make a miniature log house using empty toilet paper and paper towel rolls. This is a collective activity. You will need an empty appliance (refrigerator) or furniture box. Make a door and windows. Use fabric to make curtains. Paint or colour the indoor walls. Use paint or other materials to make bricks on the outdoor walls. Provide plenty of craft materials children can use to decorate their house. If possible, keep this house for future activities. Add a pretend telephone, small foam furniture. This may become a great reading corner. You may make a model to show children. Give children popsicle sticks and encourage them to build a house with a floor, walls, and a roof. (Open scrapbook - My home) Print this new page for each child. Ask children to draw the room they enjoy the most in their house. Add this page to children's scrapbooks. (Open creative coloring - My house seen from space) Print for each child. Children draw their house so astronauts may recognize it from outer space.